Before your child begins school, you can help him or her develop basic reading skills. 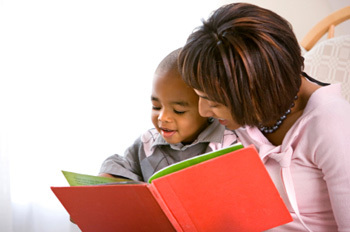 When you're reading stories aloud together, try some of these tips to help your child practice early reading skills. Most schools use phonics (breaking down words into sounds) and sight words (words that don't follow the normal rules, like 'the,' which has a short e instead of a long e) to teach early readers. Your child can learn how to recognize the difference between short and long vowel sounds and other phonics rules through flashcards, online books, games and CDs. Read books, like Starfall's Zac the Rat series (phonics) or Scholastic's First Little Readers series (sight words). Read in unison and take turns reading to reinforce pronunciation. Does your child have a favorite bedtime story that he or she pulls off the shelf for you to read night after night? Do you find that your child is excited to tell you what will happen next in the story? If you're reading a series of books, why not re-read the previous book before starting the next one? Repetition helps build confidence in new readers, as well as retention of new words. Your child may be motivated to finish the old book so that you can read the new story. Delaying the process builds anticipation and excitement to reach a goal. When choosing materials to help your kids learn to read, include a mixture of phonics books that they can eventually read all by themselves, slightly more advanced stories that you'll read together and just-for-fun materials of their choice, like comic books and magazines. Using various types of materials and activities helps make learning to read an enjoyable activity, not a chore. Do you have a childhood favorite that you want to share with your kids? If there's a book that you've read over and over again, your love for it can be contagious. What child doesn't like to play dress up? You can make reading stories fun and help improve reading comprehension through role playing. Tell your kids that after reading the book together, you'll decide which characters each of you will play. You can write a short script together, create props and dress up in costumes or masks. After you've practiced, you can even invite friends over to watch. The next time you read that story, don't be surprised how much of the story your little reader can tell you themselves.